Eminent academician Prof PB Sharma currently Vice–Chancellor of Amity University Gurugram, Haryana was awarded the coveted “Founding Father of DTU” award at the Annual Alumni Meet 2019 of DCE-DTU. 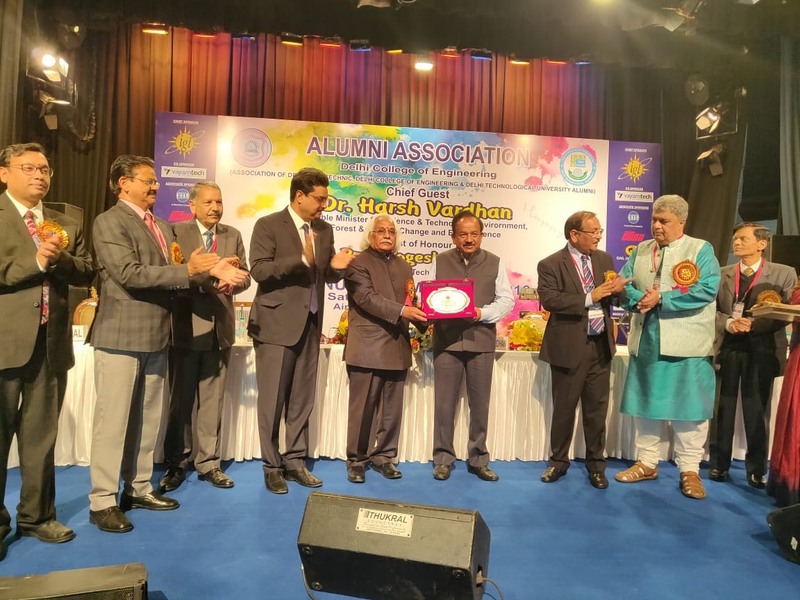 The award was presented by Hon’ble Minister of Science and Technology Dr. Harsh Vardhan at the glittering ceremony attended by approximately 1500 Alumni of DCE-DTU & their family. Patron of the DCE-DTU Alumni Association Shri Karnal Singh, former ED of Directorate of Enforcement, President of Alumni Association Dr. Muktesh Chander and very many of Alumni were present on the occasion. “May I thank you Mr President, Members of the Executive and the great Alumni Power of DCE-DTU present here and around the globe for the honour bestowed upon me of “The Founding Father of DTU”, which I accept with utmost humility. For me, the 24 years long association with DCE as its Principal from 1990 and 2009 and thereafter with DTU as its Founder Vice Chancellor from 2009-2014 was a matter of great privilege and honour. Moving out from IIT Delhi, after 12 years of highly enriching teaching and research engagement to DCE in December 1999 was a great opportunity to me to serve this prestigious institution, the Mother of IIT Delhi, and to carve out “Pathways of Research and Innovations Excellence” beyond academics. It was a great responsibility to be shouldered at my young age of 42 years and to make Mother India proud of DCE, that had the distinction of being the mother of School of Planning and Architecture of Delhi, SPA, College of Art, College of Pharmacy and as was later realized, even the mother of Faculty of Management Studies, FMS of Delhi University besides being the Mother of IIT Delhi. Presiding over such a prestigious institution and steering it on the Path to Excellence was a great opportunity and a great privilege to me. My job in the office of the Principal DCE was to create the necessary excitement and interest in the talented student community and faculty in the new and emerging areas of scientific exploration and technological advancements so that the vital synergy could be created between education and research in an institute of higher learning such as DCE so as to eventually transform DCE into a Technological University of great eminence. This dream of the founding fathers of DCE was eventually realized in July 2009 when DCE was transformed into DTU (Delhi Technological University) through an Act of Legislature of Delhi, DTU Act-6 of 2009. The innovative layout of DCE-DTU new campus inspired a lot of confidence in “Making Innovation a Habit” and a major platform to mount a number of well thought innovative projects. Being a keen researcher and innovator, I devoted myself to percolate culture of research and innovation right down to UG levels. I always thought that the undergraduates are the reservoir of immense creativity and possess abundance of innovativeness. It is this potential of UG students that is often not tapped in institutions of higher learning, though it has immense possibilities for accelerating innovations and creative research. Hence, at DCE right from my days of my taking over as Principal of DCE, I opened my doors for the talented innovative minds of students while at the same time marginalizing the mediocrity. My efforts worked wonders. 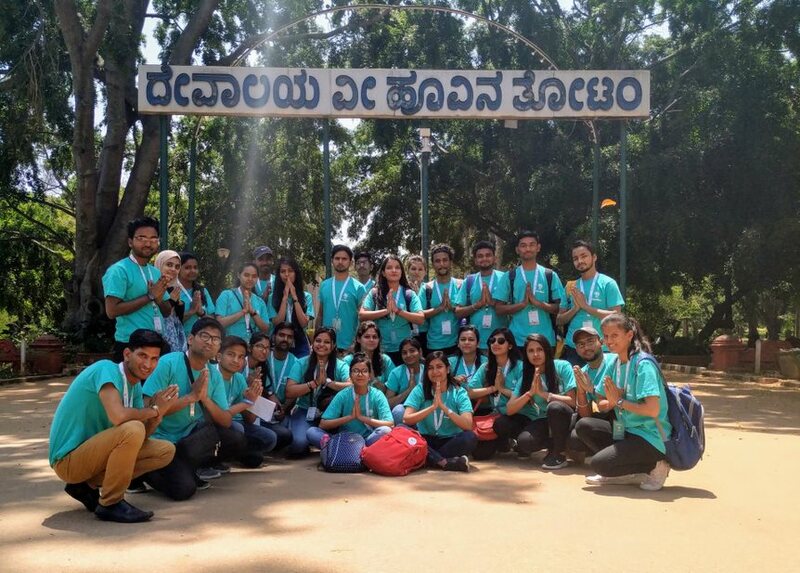 Due to research and innovation focus, the quality of UG and PG projects at DCE became a major attraction for industry and society and the campus placement became so phenomenal as to surpass even the IITs in the return of investment, in fact DCE scored number one position in top 10 best engineering institutions, including the IITs. This euphoria continues even today and DTU remains as the first attraction for very many world class industries and corporates for placement of graduating students. Further, it is because of a caring mentorship and inspiring leadership that DCE and DTU achieved high acclaim worldwide for India’s First Hybrid Car in 2005, that received the First Prize in student category at the global competition of green cars in Newark in US, Most Innovative Design Award from AUVSI of US for India’s first Unmanned Aerial Vehicle, DCE-UAV in 2006, Best Initial design Award for DCE Autonomous Underwater vehicle, DCE-AUV in 2007 and India’s first Solar Passenger Car, DTU-Solaris, that was flagged off by Hon’ble Founder President of India from the precinct of Rashtrapati Bhawan in September 2012. All such innovative endeavours of students community made DCE-DTU a “Factory of Innovations” and made its vast Alumni Community proud of the accomplishments of their Alma Mater. With the transformation of DCE into DTU came a new responsibility to excel beyond the frontiers of Science and Technology education and research. The autonomy of the University of Technology has indeed assured the vital “Freedom to excel” and unmatched accountability to its stake holders i.e. you the Alumni among others. I used this privilege to excel and accelerate the march of DTU to its new horizons of glory and accomplishments. This led us to achieve accelerated growth with quality and with our research and innovation driven educational R & D programs. “Inspired by Talent and Driven by Innovation” became the mantra of branding DTU and achieving success beyond the peaks of excellence attained as DCE during my 20 years long leadership to DCE. I can draw a lot of satisfaction, that during its first five years of establishment, DTU flew the flag of global esteem with high quality education to approximately 8000 students (as against 2500 in DCE) and taking a leadership position in a number of front line research areas such as Nano-sciences and Technology, New and Smart Materials and Composites, Artificial Intelligence, Robotics, Broad Band over Power Lines, Software Engineering, Mechanical Design, Bio-Fuels and Renewable Energy Systems,Environmental Management and Mathematics and Computing to name a few. With a highly innovated curriculum and ample opportunities for hands on experience, we assured that the march of DTU continues unabated on the Path of Excellence and unmatched glory. I have every reason to believe that the thrust of initiatives taken, momentum of innovations & world quality, society relevant R & D at DTU shall continue to win for its students, faculty, alumni and all of us added pride for decades to hereafter. May I congratulate the class of 1969, celebrating its Golden Jubilee of graduation today, the distinguished Alumni Mr Raj Soin, Prof Yogi Goswami, Dr. VK Mahna and many of their batch mates of the class of 1969 have made us all proud by their distinguished services to the humanity at large, I am truly delighted that your Golden Jubilee of graduation coincides with my 50 years of continued engagement in the service of technical education and research. God bless you all and your family. What more the batch of 1994 celebrating its Silver Jubilee today was in fact the batch that entered DCE with me in 1990. Many of its graduates have made us feel immensely proud. I thank you Hon’ble Vice-Chancellor Prof Yogesh Singh, Mr President Dr. Muktesh Chander, Vice President Shri Suresh Raheja, Secretaries Shri Sunil Saxena and Dr Diptimal, Immediate Past Presidents Shri Karnal Singh and Shri Sanjay Dewan, Former Secretary General Shri PK Adlakha, my dear friend and a great Alumni connect Shri Arun Gupta, very my distinguished Alumni present here and each one of you for giving me this opportunity of being with you on this momentous occasion of DCE-DTU Alumni Meet-2019.